Indentification of this design as number 113 is original to Rakusan who designated this woodblock print as the 113th design published in his main sequence. However, 113 is actually the thirteenth of thirty-six woodblock prints in Rakusan's second main sequence series, 篁子生画選, Koushisei Gasen, lit. 'Koushisei's Print Selection' (usually called here the 36 Series). The woodblock print of 113 was adapted from an actual-size original painting on silk. All of the original prototype paintings for this series are currently in a single private collection. Like most 36 Series designs 113 has the same signature and seal combination on every copy. Therefore, for 113 only a single extended edition I (which includes potential reprintings both before and after World War II) can be distinguished. It is usually only possible to date an individual loose print of 113 with edition I markings by listing approximate potential ranges of 1934-1941 and 1948-1955. The copy illustrated above is typical of edition I. The Rakusan project which produced 篁子生画選, Koushisei Gasen, resulted in two related series of woodblock prints. Each print of the 36 Series is intimately connected to a group of prints with the same subjects in the Fan Series. Together these subject-related prints in the two series constitute a theme. Each theme consists of a quintet of monochrome Fan Series designs (one design in each of the five fan shapes), plus one polychrome, 36 Series design which illustrates the theme subject. The theme is labeled here by the original Rakusan number of its 36 Series design followed by the subject. 113 is the 36 Series design of the 113 Cockscomb theme. The 113 Cockscomb theme is one of the many entirely regular themes represented by a complete fan quintet and a color woodblock print. Four of the five Fan Series designs have seal C which indicates carving dates between the last months of 1933 and the end of the first quarter of 1934. However, the 36 Series design 113 and the remaining Fan Series design have seal B which indicates a later carving period closer to the time of publication. The Fan Series and 36 Series prints of the 113 Cockscomb theme were distributed in mid 1934 in installment five (of twelve). The delivery documents for installment five remain to be discovered, but its delivery month was either July or August 1934. The woodblock prints would have been printed earlier in the same month as their distribution. The contents of installment five had been previewed in the delivery documents for installment four in June 1934. However, a different theme had been announced as 113, and the cockscomb designs were apparently a last minute substitution for this position in the publication order. The name used here for the 113 Cockscomb theme is a literal translation of 鶏頭, keitou, upon which the Japanese names for not only all varieties of cockscombs, but also for amaranths and other members of the Amaranth Family, are based. The six designs of the 113 Cockscomb theme include four crested cockscombs, one plumed cockscomb, and a tricolor amaranth. Therefore, the theme is related not only to the crested cockscomb design 35 of the earlier 100 Series, but also to the tricolor amaranth design 55. At least some 113 Cockscomb theme designs were adapted from sketches originally created in the late 1920s for those earlier large designs (see below). Although not native to Japan, cockscombs and the related amaranths are old garden imports which for centuries have been extensively bred and hybridized by Japanese horticulturalists. 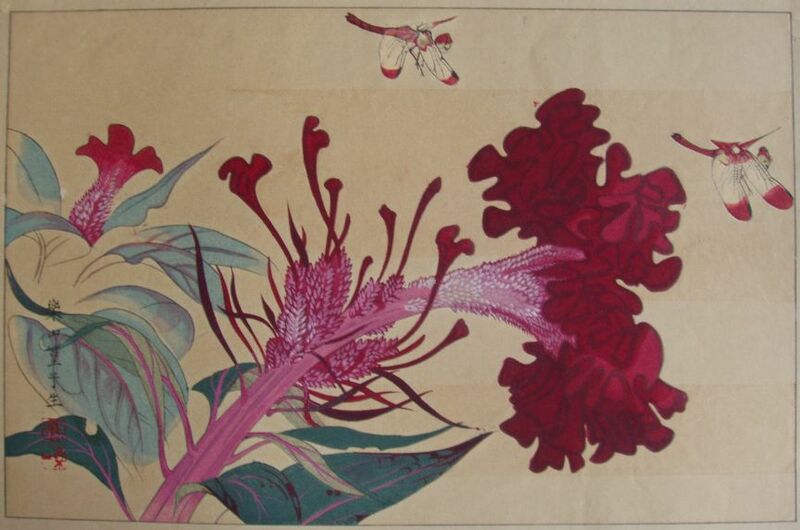 These plants were favorite subjects for Rakusan and several diffferent kinds appear in his prints and paintings. The general name for the group is also the species name of the crested version of cockscomb (sometimes simply called cockscomb), Crested Cockscomb, Celosia (argentea var.) cristata, 鶏頭, けいとう, ケイトウ, kei-tou, lit. 'chicken-head'. Crested Cockscomb is the variety Rakusan illustrates not only in 113, 35alt, and 35; but also in three of the fan designs in the 113 Cockscomb theme. In addition to the dragonfly in the 36 Series design 113, two Fan Series designs in the 113 Cockscomb theme also include skimmer dragonflies. However, neither these two (nor any other Rakusan dragonflies) can be the same species as in 113, but other identification is largely speculative. There are five other skimmer dragonflies which occur in monochrome fan designs; so only the patterns (if any) are available for identification. 113-2 and 133-5 are simple line drawings which lack further diagnostic details. 113-4 and 106-4 have markings on the body that suggest those skimmers are female, and the solid color body in 128-1 suggests a male. All of these other examples could be any of several closely similar skimmer species. One representative red darter candidate would likely have appealed to Rakusan since it is a common endemic, Autumn Darter, Sympetrum frequens, 秋茜, アキアカネ, aki akane, lit. 'autumn madder-red'. Another possibility would be a skimmer species in the genus Orthetrum such as Common (White-tailed) Skimmer, Orthetrum albistylum speciosum, 塩辛蜻蛉, シオカラトンボ, shiokara tonbo, lit. 'salt-spicy dragonfly'.